Despite the store-bought tortilla, that ceviche still looks pretty good. Do you know what kind of fish they used? Was the fish raw in the ceviche? Good question. I'm embarrased to say, I have no clue what kind of fish it was. My guess is tilapia, but it could've been any number of white-fleshed species. The fish was fully cooked though, but from the texture, I think it was cooked by the grace of the acidity of lime. Wow! Sounds terrific...did you try any other dishes there? Good point there. Another question is why don't steakhouses have murals of grazing cattle? I haven't tried the other dishes at this restaurant, but a lot of them look great. Mmm, I love ceviche! That photo's beautiful--good job!! Elmo.... I'm not sure how you keep your 'girlish figure' with all the great food you eat! LOL! Once again, a new place to hit this weekend! Thanks! It was the first time for fish ceviche for me. And I wonder now why it took me so long! Ah, well, this one's definitely light on the waist line. But I have gotten a bit girthy lately...too much good food! 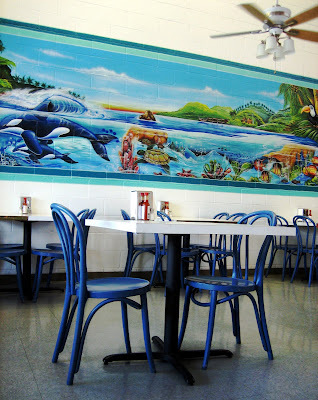 We have the same "stone's throw" layout for Mexican seafood joints in Phoenix. 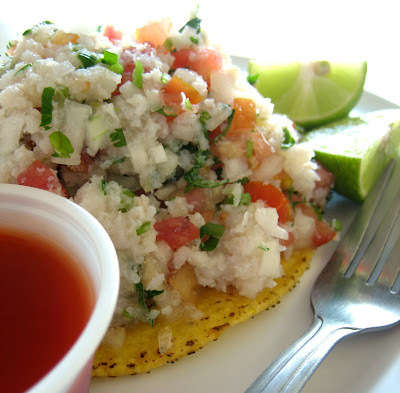 There is one every 1/2 mile in East and West Phoenix where dirt cheap seafood can be had in a taco, tostada or enchilada. You are correct that it is guilt-free and refreshing. I love going up to Santa Ana for Mexican food when I am visiting J. in O.C. A Mexican restaurant that specializes in seafood? I'm in heaven. Thanks for noticing my "damp cotton" analogy! I was especially proud of that one myself. I'm just getting started with this mariscos bent. We are both lucky to be near such great places to have it. Now if only I can find me some cheese crisp nearby! It's practically walking distance from where I work. Yachtzee! I can verify that the Campachana is to die for. I think of it and my mouth starts to water. it is loaded with tasty, briney, crunchy shrimp and fish and octopus and some fake crab for good measure. The sauce is perfectly tart and sweet and tomaoto-y, you can just drink it down. I Love it, you gotta try it next time. Hint, get the medium size, same amount of fish, just less sauce.